My Review of Mark Philip Bradley, The World Reimagined: Americans and Human Rights in the Twentieth Century. New York: Cambridge University Press. 2016. 306 pp. $29.99 (hardcover). 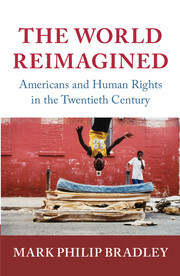 “Once at the margins, human rights and its history are now at the intellectual vanguard of the historical profession.” (p. 4), Mark Philip Bradley trenchantly observes in the introduction of his new book The World Reimagined: Americans and Human Rights in the Twentieth Century. Indeed, over the last decade the history of human rights has crystalized as a prospering field of research and has been the subject of a lively and indeed hotly contested debate among international historians. A series of pioneering books has focused on the question of the take-off moment, when the language of global human rights gained a central importance in today’s world. In the context of this very stimulating debate one group of historians placed the emphasis on the 1940s as the crucial period, while others see the 1970s as the decisive breakthrough moment when the current meaning of human rights took shape. In his excellently written monograph Bradley also focusses on these two crucial decades. However, he does so in a rather different way, highlighting the complexity and ruptures of this development. He approaches the 1940s and 1970s as contrapuntal moments in order to present an alternative narrative of the role of the United States in the history of human rights over the course of the twentieth century as well as to offer a new way of writing global human rights history itself. By focusing on the significant interplay between the global and the local in the creation of American human rights vernaculars, the book hugely enriches our today’s understanding of universal human rights. If you are interested in reading the whole review, you can find it in the recent issue of Diplomatic History.